In the next phase of creating a PCB with KiCad you must connect the components to “modules” (a term KiCad uses to refer to footprints) with cvpcb. You can open cvpcb from the KiCad main window by pressing the second large button. cvpcb will issue a warning about not finding a .cmp file but this is normal before you have saved with cvpcb (which in turn creates the .cmp file). This phase is relatively simple, you just need to find the correct footprint from the list on the right and connect it to the component on the left by doubleclicking it. You can view the selected footprint with the “View selected footprint” button the the top toolbar. I do not suggest you use the footprint filtering system because it can be confusing. Basically cvpcb just connects the component pins in the schematic to the footprint pads (pin number 1 in the component in the schematic gets connected to the footprint pad number 1 and so on). It might take a while to get used to the naming convention and find the footprints you need. KiCad also does not have a huge selection of footprints to begin with, but the upside is that making new footprints is really simple. 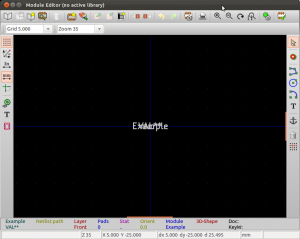 One advantage with KiCad is that you also do not have to connect the component (graphical symbol) and the module (footprint) together (like Eagle) so you can easily re-use the footprints for other parts and projects. KiCad most likely will not have all the footprints you need, so you must create them yourself. You can do this with the module editor. To access module editor you need to open pcbnew from the KiCad main window (third large button). Pcbnew will give you a warning about missing .brd file. You can open module editor from the top toolbar. After opening the module editor, create a new module with the “new module” button from the top toolbar. Name the module (give it a descriptive name so it is easy to find and remember what module it is). Basically the only thing that really matters are the pads. You can draw graphic lines and other graphics to visualize the component and its dimensions. You create pads with the “add pads” tool from the toolbar on the right. Now click somewhere to place a pad. After placing the pad change the pads settings and pad number by pressing “e” on the pad (or right clicking it and going to “edit pad”). Change the pad settings to what you need. The pads need to have a correct pad number or else they will not be connected to the right pins in the schematic. If you want to make a hole, just make a pad with with the “shape size” as the same as the drill size (as far as I know, this is the only way to make a hole in KiCad). The grid determines where you can place the pads. Check your components datasheet or manufacturer website for suggested footprint and try to replicate that. You can use KiCads preset grid sizes or you can set your own custom grid size from the menu Edit -> Dimensions -> User grid size. After you are finished I suggest you save the module to a new library with the “Create new library and save current module”. You also need to load the library to cvpcb from the menu Preferences -> Libraries -> Add so you can use it. When you are done with cvpcb just save and continue to the next part of the tutorial which deals with pcbnew. I will add a link to the next part once I have published it! – If through hole part drills get soldered in each layer if it is a multilayer PCB. If so, how do you indicate antipads for internal layers? – most importantly, how to use thousands of footprints many have already posted. So far, I have not been able to. For calculating component pad sizes and tolerances you could have a look at the IPC7351 standard which specifies which size footprint pads and such you need. 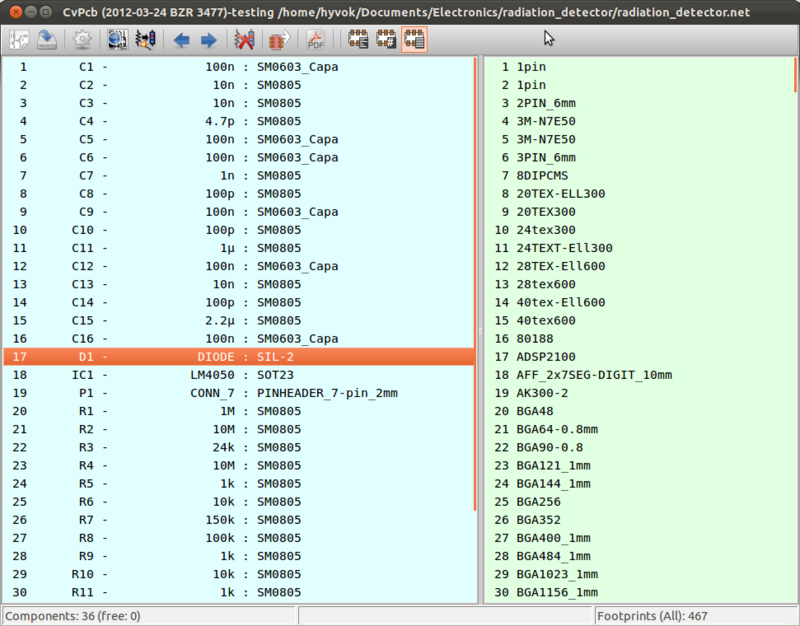 For putting a footprint to the other side there was some kind of “flip” (or similar) named menu option in pcbnew.